In the heart of the Napa Valley wine country about an hour's drive from San Francisco is a tiny town in the rural countryside with a population of about 3000. 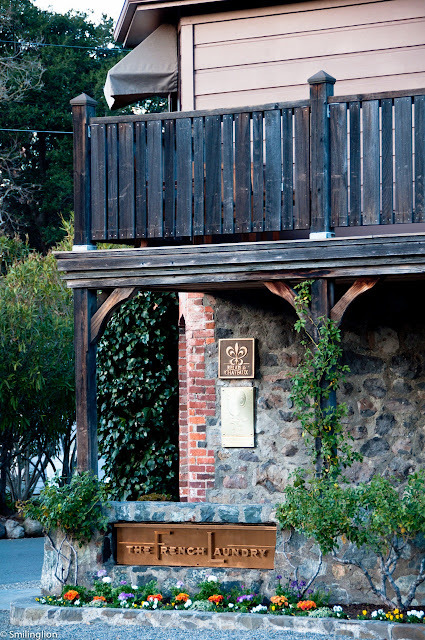 Yet despite its humble size, Yountville is a place of some import on the culinary map of the USA. 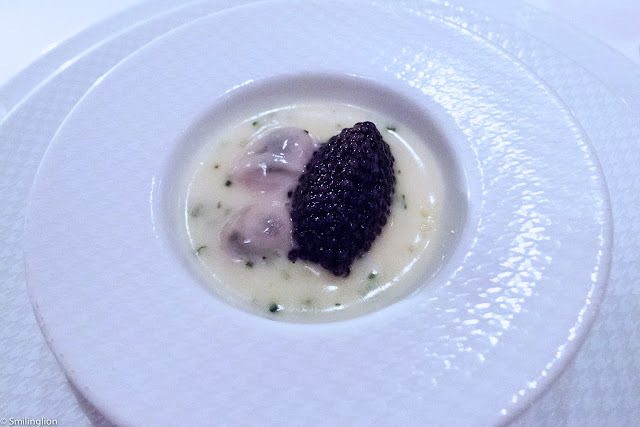 Because it probably has the most Michelin stars per capita in the country (5 stars shared between 3 restaurants). 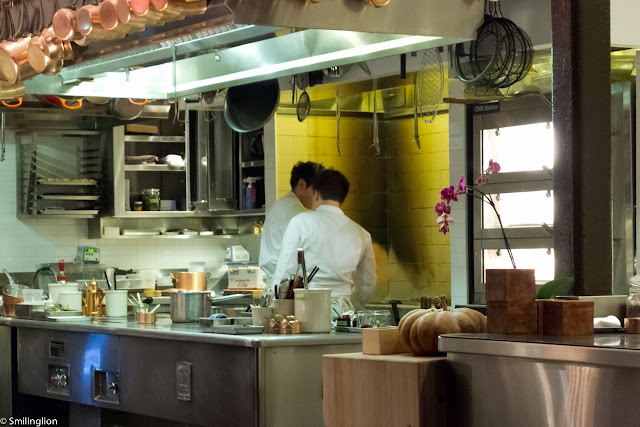 It is also the most unexpected place where one can get a good meal at any time of the day (the preserve of the really big and vibrant cities, rarely that of rural countryside hamlets), even late at night. 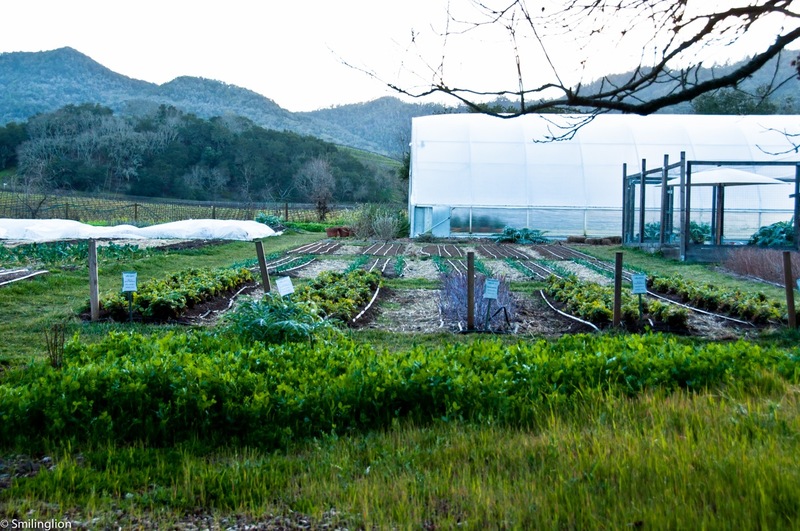 In addition, Yountville is strategically located between Napa town and Calistoga, which are the ends of the key tourist route of the Napa Valley wine region. 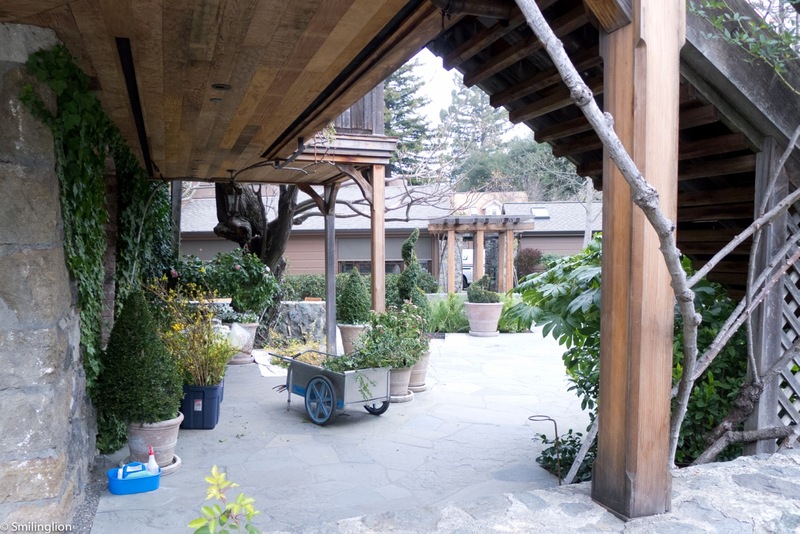 It is for that reason that we decided to spend four nights in Yountville and use it as our base to explore the Napa Valley region during our recent trip to the USA. In the centre of Yountville is the very distinctive red brick-clad building which houses Thomas Keller's bistro, Bouchon. This is a one-star eatery which is styled in the manner of a French bistro and is both casual and open till late every day of the week. 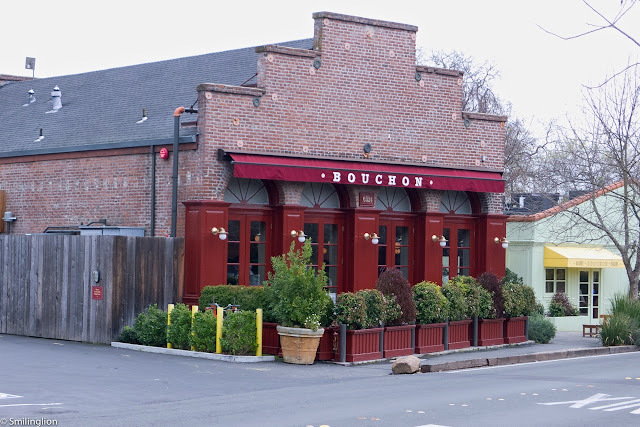 Just next to the red Bouchon Bistro is the equally recognisable yellow facade of the Bouchon Bakery, where Yountville residents and tourists alike queue every morning and throughout the afternoon for its warm bread, sandwiches and pastry sweets. 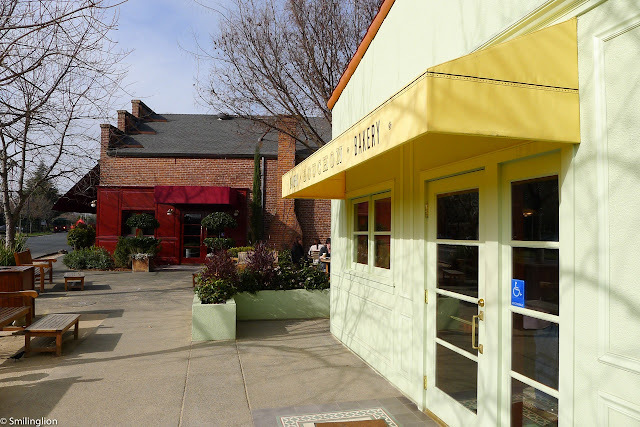 In the town where he made his name, Thomas Keller's fingerprints can be seen all over, and in addition to his culinary temple The French Laundry and the Bouchon bistro and bakery pair, he has a few other casual eateries within walking distance, making it really difficult for one to spend any time in this town and not dine at any of his establishments. 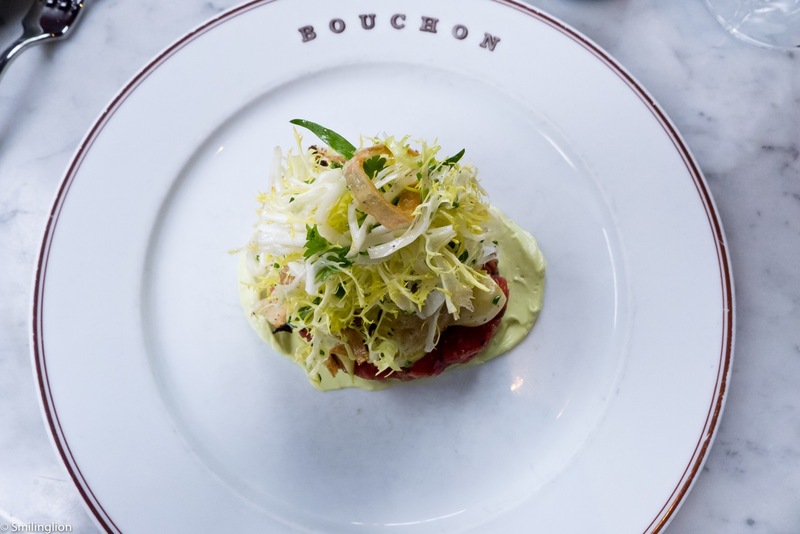 Bouchon Bistro's menu is set out simply on a one-page menu, and includes the usual french bistro fare. Lobster bisque: This was an excellent soup which was a special dish of the day. 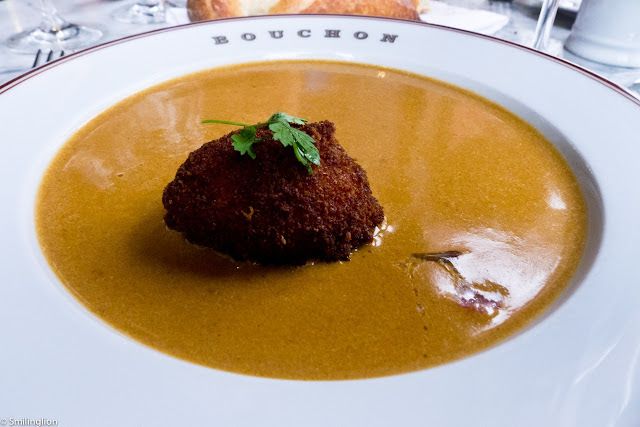 The bisque was rich and thick and on it was a large nugget of breaded lobster. Steak Tartare: Another appetiser off the menu was the steak tartare which was also very good. 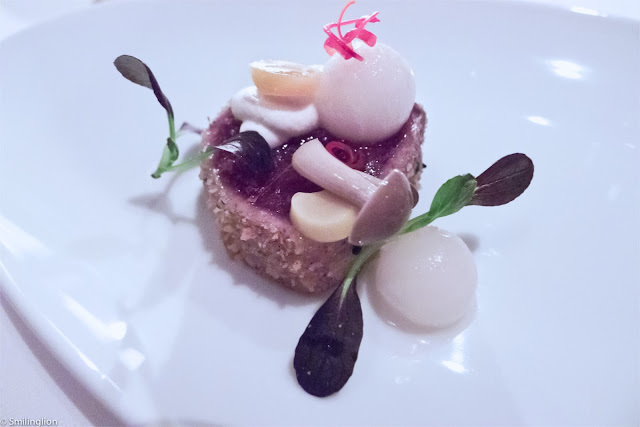 The pieces of raw beef were cut quite uniformly into cubes and was of a high quality (no tendon or fatty parts). 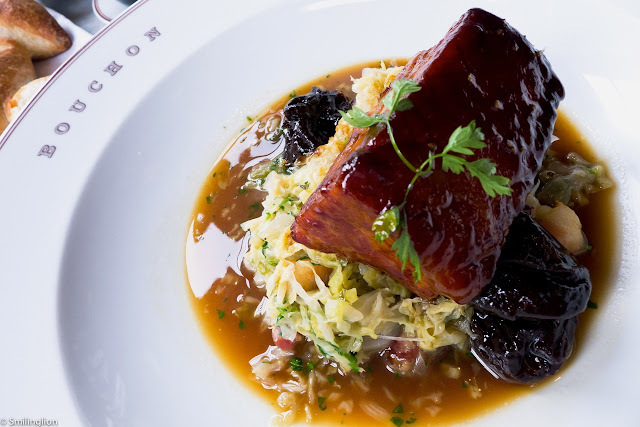 Poitrine de Porc Glacee - glazed pork belly, braised cabbage, bacon lardons and poached prunes with pork sauce: A dish which we ordered off the menu, the pork belly was delicious, and its strong flavours were well balanced by the sourish cabbage. 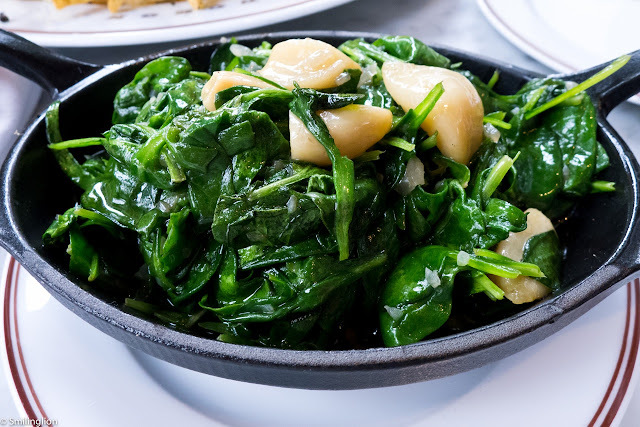 Sauteed spinach: A good side dish of greens to accompany our main courses. 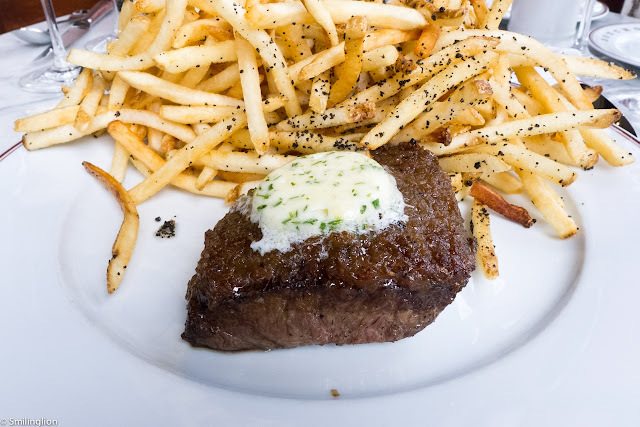 Steak Frites - caramelized shallots, maitre d'hôtel butter served with truffled french fries: A bistro classic, the steak was juicy and flavourful. We opted to top up for the truffled fries but in hindsight the normal fries were probably good enough. The portion of the fries was huge though and we didn't manage to make much of a dent in it. 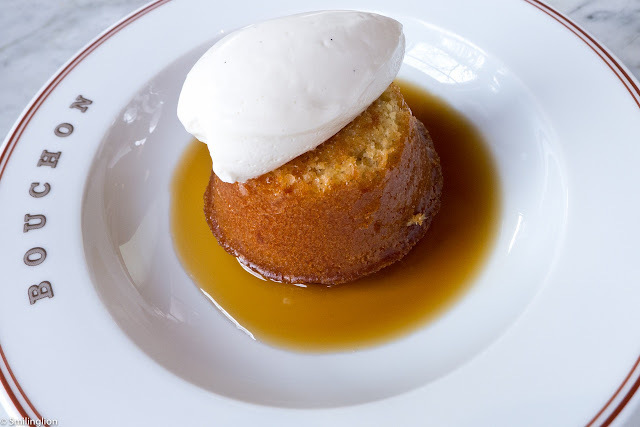 Baba au Rhum - Gosling's rum soaked brioche with creme Chantilly: The rhum baba is a dessert we always order when we see it on the menu and the one here was very good, although this version was a bit lacking in the alcohol. Impressions: The standard of the bistro fare at Bouchon was very high. The food was excellent and cooked with some finesse. This would be a great place to have lunch or to catch a late meal at night, given its casualness and the fact that it opens throughout the day and till late at night. Update: Saison won its third Michelin star in the 2015 Guide. 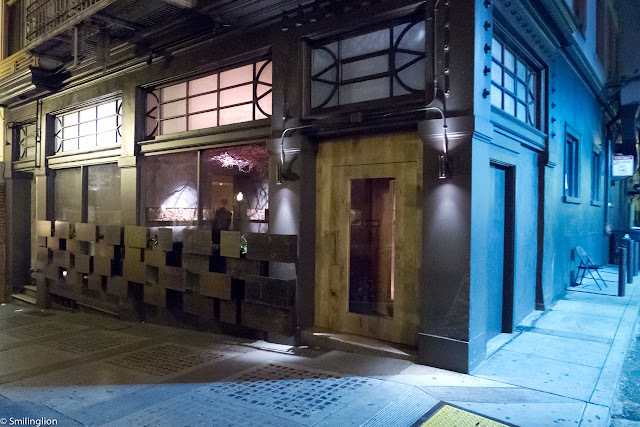 In 2009, two young men, who between them possessed not inconsiderable food and wine knowledge and skills, started a pop-up restaurant in the grungy neighbourhood of SoMa in San Francisco, which then morphed into a more permanent establishment of what has become known as one of the best restaurants in the city. 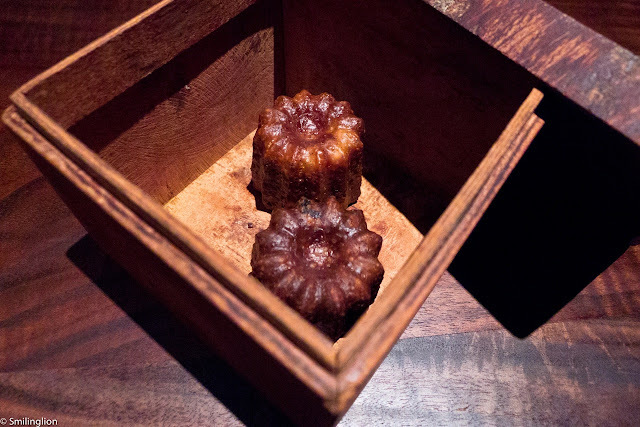 The obligatory plaudits followed and before long they received two Michelin stars and a big cult following. In 2013, they moved into their new premises (also in the SoMa district but in a more upmarket area) just across from the AT&T Park (the home stadium of the San Francisco Giants baseball franchise). It so happened that we visited them on their opening day of their new premises (we made bookings months earlier before the official announcement of the move and were only informed about the change in venue shortly before the date). Both men were in attendance that night; the very intense culinary wizard Josh Skenes and his partner, the charming wine savant Mark Bright. There was a palpable sense of excitement coupled with tension for their opening night in what they hoped was (according to one of the servers) their premises "for the next 50 years". There were, as to be expected, certain 'issues' resulting from the move which was yet to be resolved, for example, the guest toilets were not yet open for use (we had to use the makeshift toilet in the staff quarters) and some of the cocktails and wines in the drinks menu were not yet available. 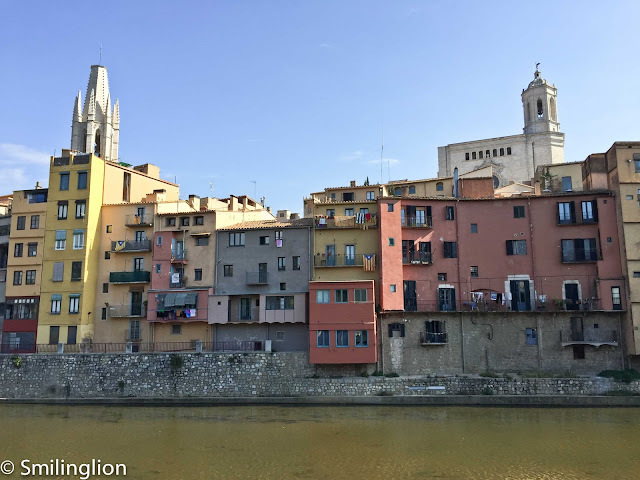 They were most apologetic for these 'lapses' which if we were being honest, weren't even that critical to us guests, especially in the context of expected teething problems arising from a recent move. 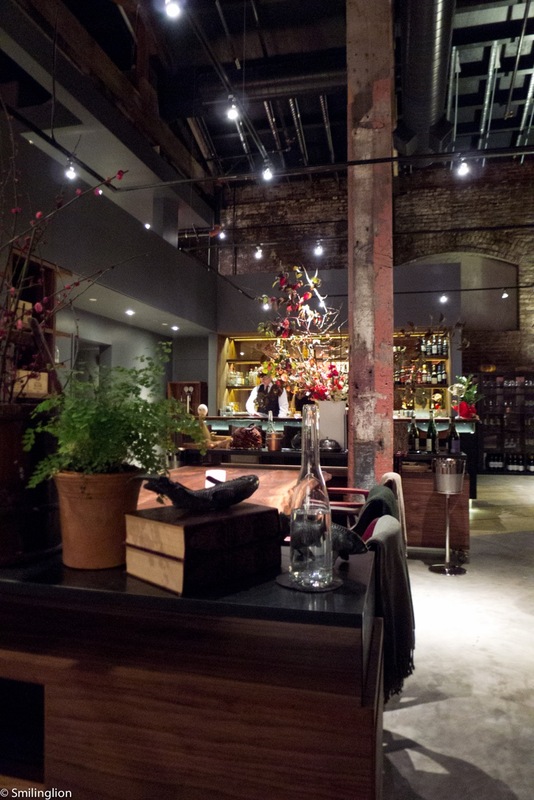 We had not been to the old restaurant, but we were in awe of the new space. A rather nondescript entrance along the side of Townsend Street opened up into a large two-volume loft-like space with exposed brick walls, a concrete floor and a chic industrial and unfinished look. Aside from some bar seating (where they serve a smaller menu with tapas-style food), there were only a total of 18 seats spread out in a relatively large space, and the tables were separated quite strategically by countertops, flower pots and pillars. In this layout, the entire dining room was an extension of the kitchen, as there was otherwise nothing separating the diners from the rows of kitchen countertops and stoves (our table, which was in the centre of the room was just next to a row of fridges and freezers). This enabled us to watch at all times everything which was happening in the kitchen, yet still felt like we were shielded from the other diners by various potted plants and other paraphernalia. 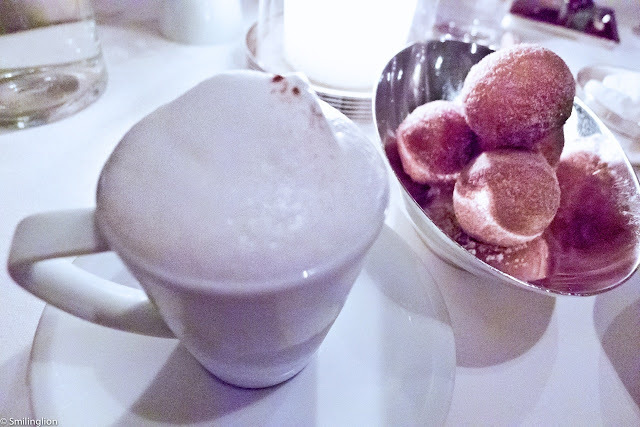 Before we go into describing the meal, it must be said that the entire dining experience was superlative that evening. Taking the food out of the equation for the moment (as this will be covered below), this was probably our most enjoyable meal ever, and this is no mean feat given the number of other fine dining restaurants throughout the world at which we have had the good fortune of dining. And all this originated from Josh Skenes' and Mark Bright's concept of dining at the chef's table, whereby all 18 of us diners, though we were spread out throughout the large dining room, were treated as if we were all part of a large communal table seated around the kitchen (made possible by the very unique and inspiring layout of the restaurant). All through the dinner, although we had an allocated server to take care of us, various different members of the service staff as well as many of the chefs took turns to serve us our food, often spending a minute or so to engage us in conversation, whether about the food, the wine or just making casual chit chat. Even Chef Josh Skenes brought one course to our table and explained the dish (though he was a bit stern and to be honest we were a bit scared of him). In this manner, we had the chance to interact with almost all of the staff during the course of our meal, and it literally felt like we were eating at a kitchen counter overlooking the kitchen, yet retaining the privacy of sitting at a table separated from the other guests (which would not have been possible in a typical chef's table set-up). All these would not have been possible without the highly commendable service by the staff. 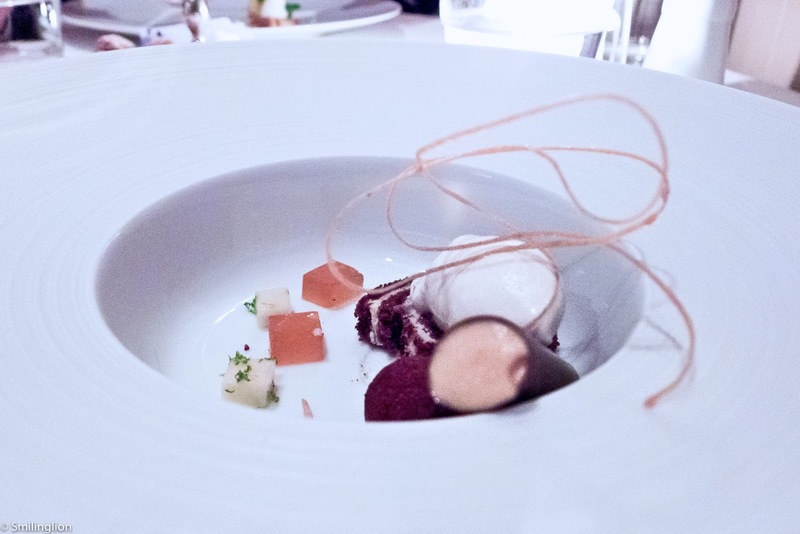 From the moment we stepped into the restaurant until we finished the meal and stepped out, we weren't just treated like royalty (which is to be expected in a 2-3 Michelin star restaurant); in fact, we were also treated like friends. The memory of the warmth and sincerity of the service that evening will stay with us for a long time. 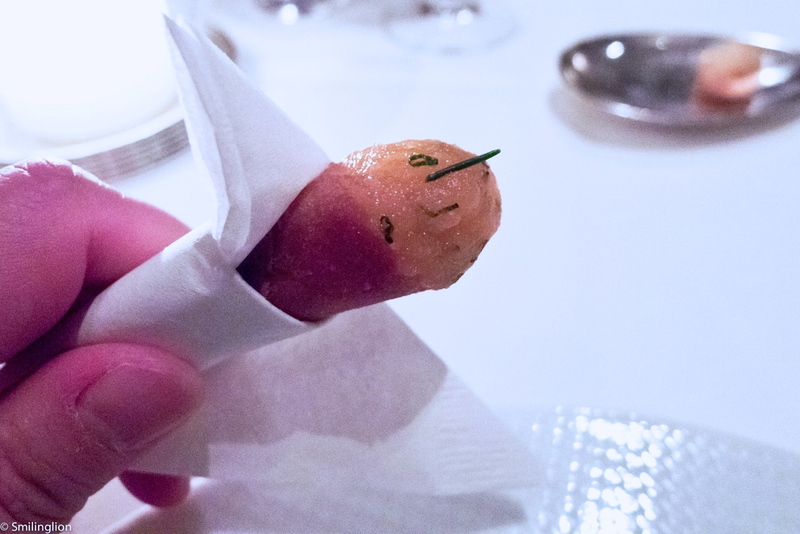 We were served bespoke cocktails at the bar while waiting for our table, and when finally seated, shown a single tasting menu printed on a sheet of paper. This was the meal for the night and there was no option for a la carte or a shorter tasting menu, and after taking down our allergies and dislikes (for which we had none), we were to have left it all to the Chef and his kitchen to entertain us for the evening. Not knowing what we were going to eat, it also made ordering wine difficult (as we wouldn't have an idea what wines to pair with our food), so we went with the wine pairing option as well, which turned out to be an inspired decision. 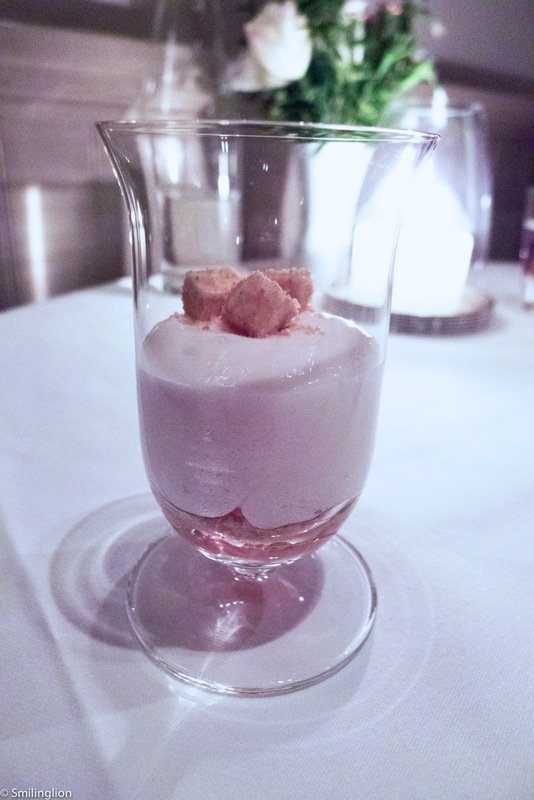 Before the food service started, we were served with a glass each of Krug Grand Cuvee, in a Krug champagne glass. It was a statement of intent. 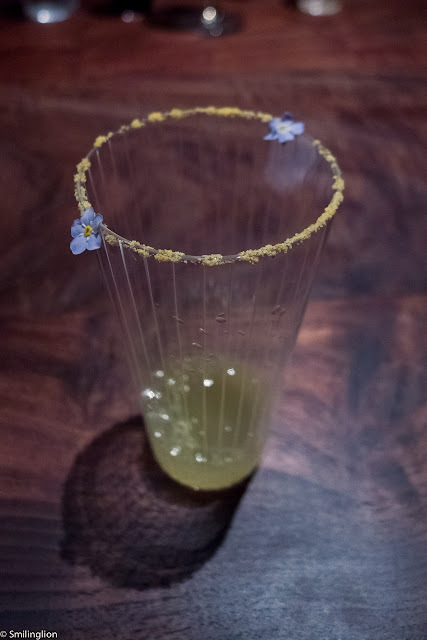 The glass of a citrus drink which tasted like limoncello with citrus zest with 2 cute petals coating the rim of the glass was our palate cleaners before the menu commenced. Dinner commenced with a simple yet tasty black truffle infused chawanmushi (Japanese-style savoury egg custard). 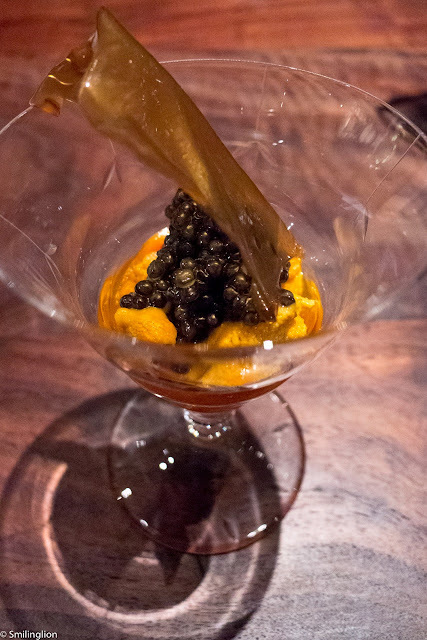 The cocktail glass of a generous dollop of fresh and raw sea urchin and an equally generous spoonful of caviar (which was smoked in the kitchen) was combined with a base of pumpkin which provided the sweetness necessary to bring out the flavours of the exotic seafood. 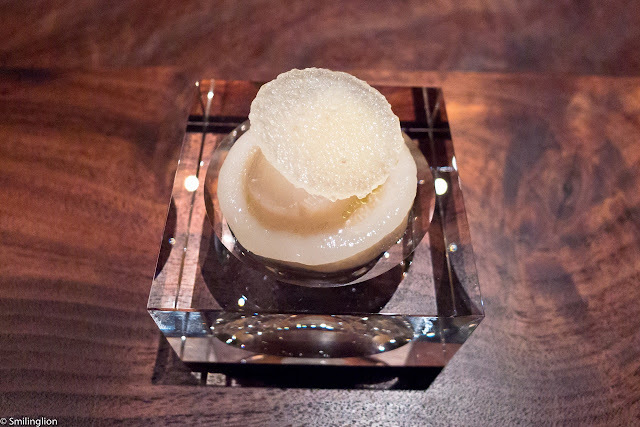 Next, on a solid glass block reminiscent of a small glass cigar ashtray sat a live scallop with a slice of pear. 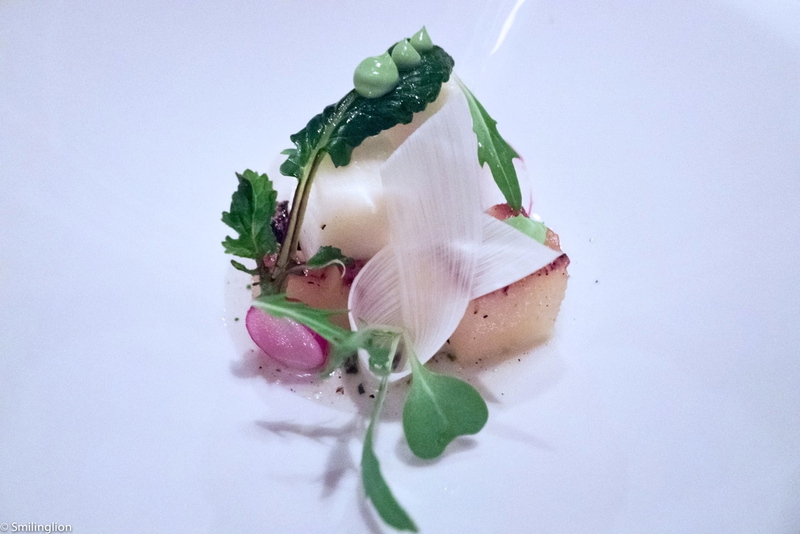 The subtle pairing of the sweetness of the fruit and the cold and clean taste of the scallop was an unusual yet refreshing experience for us. Continuing on the raw seafood theme was the mackerel wrapped with a gelee made from fish bones. 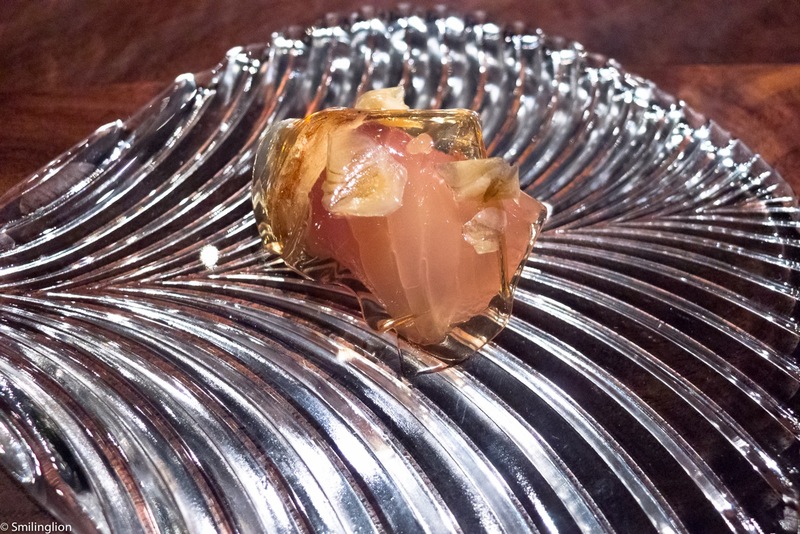 The gelee was packed with umami flavour which really complemented that of the raw fish. 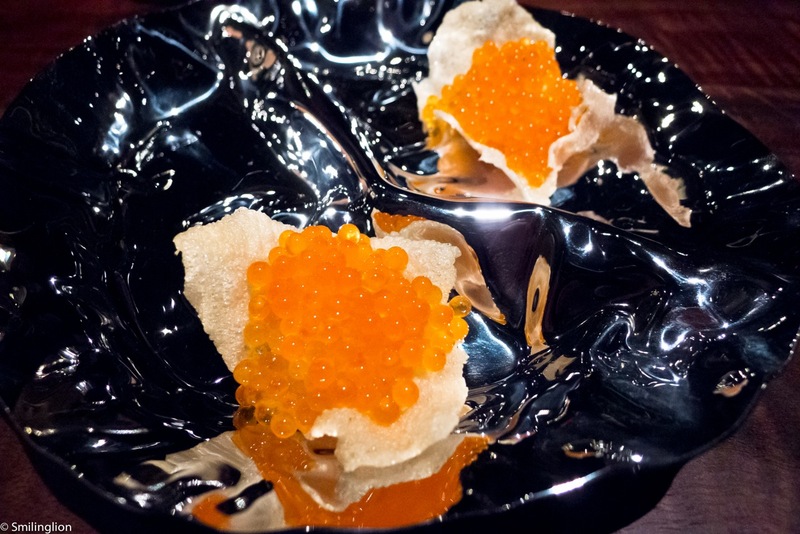 The relatively simple concept of putting lots and lots of fresh fish roe on a fish cracker was in fact one of my favourite moments of the dinner. Putting the entire piece in my mouth, the fish roe exploded releasing cold flavours amidst the dry crunchiness of the cracker. 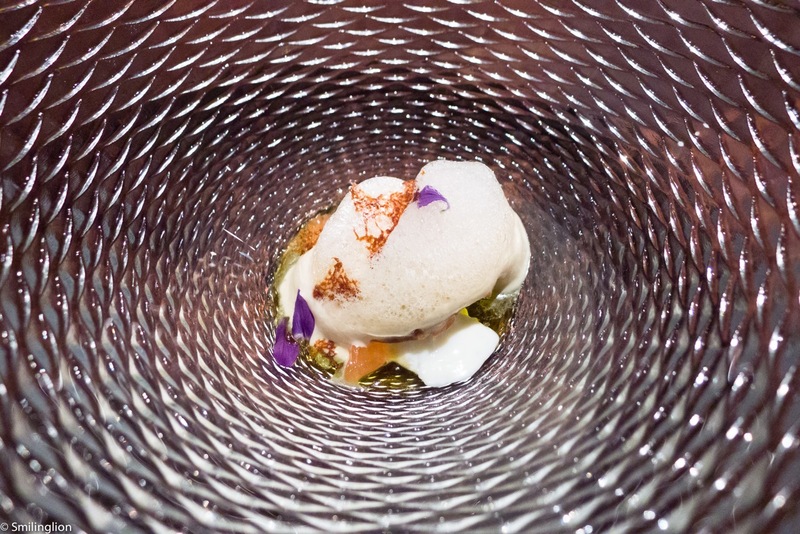 We thought this was a very clever combination of taste and texture yet executed in the simplest manner possible. 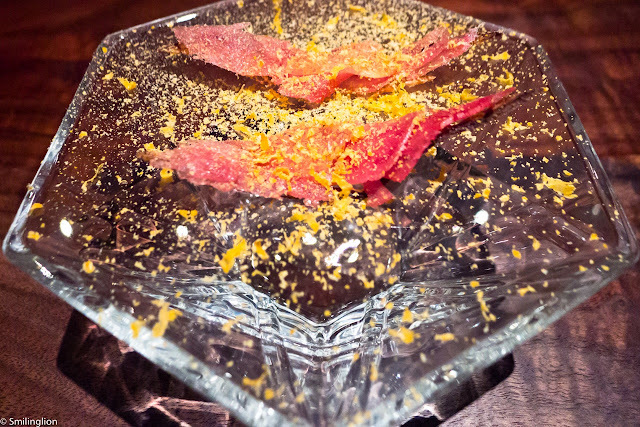 Sashimi-like strips of raw blue fin tuna were then covered with air-dried flakes of sea urchin. 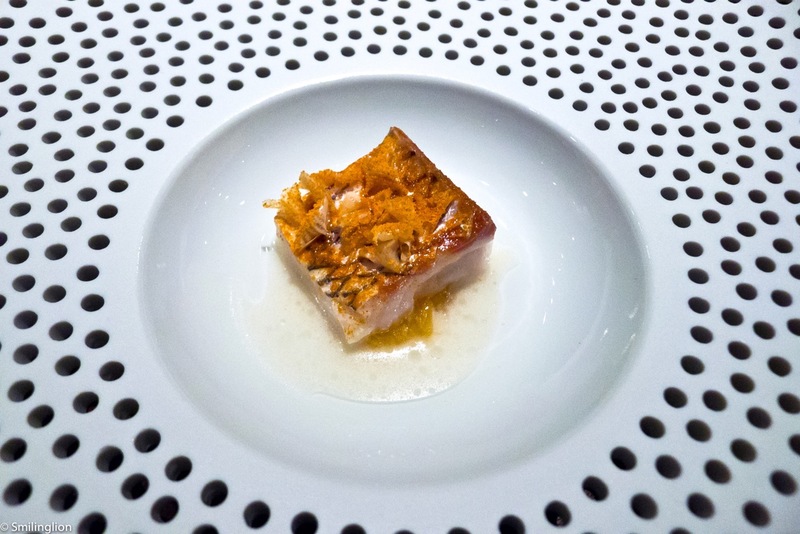 It was an interesting idea, but we felt that the sea urchin flavour didn't really manage to hold its own against the dominant taste of the tuna. 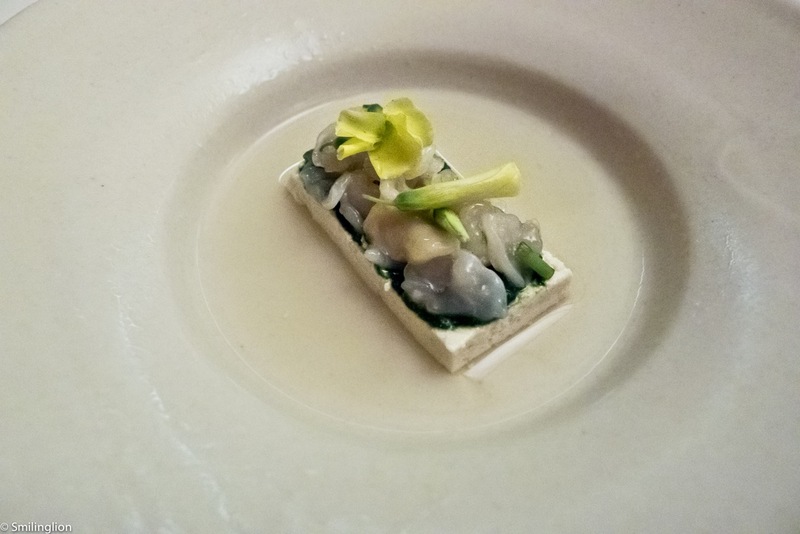 Next was the Monterey abalone with wheatgrass, and it carried on the seafood theme of the evening with a noticeable change in emphasis towards vegetables with a rather herbaceous tasting dish. 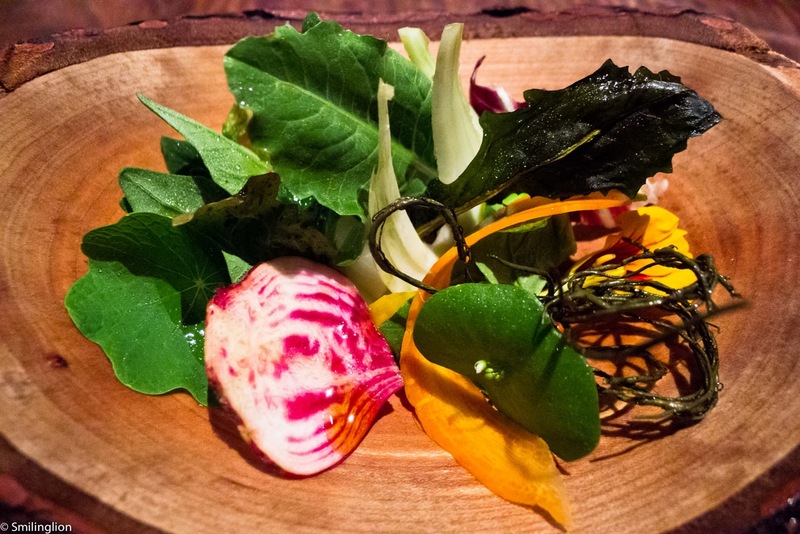 This brought us nicely to the midpoint of the meal, where we were served a wooden plate of various different vegetables each prepared in a different way. 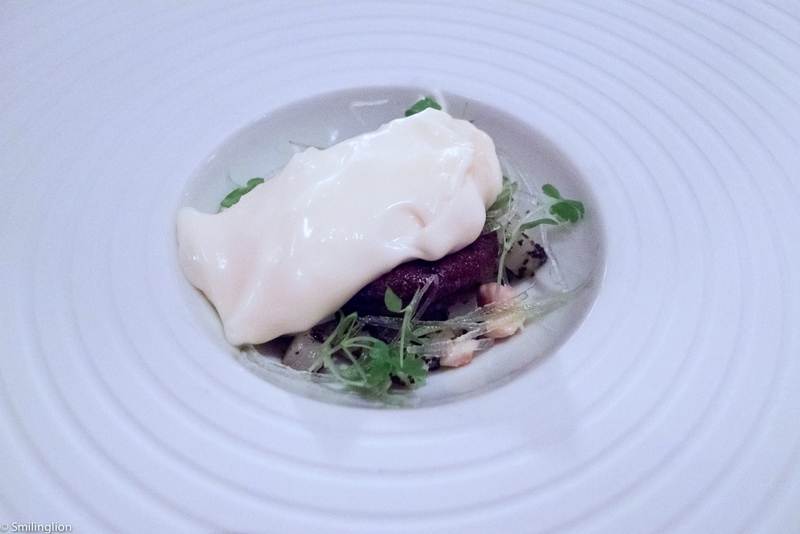 We thought it was brilliantly put together and the variety of tastes, textures and temperatures combined to perfection. 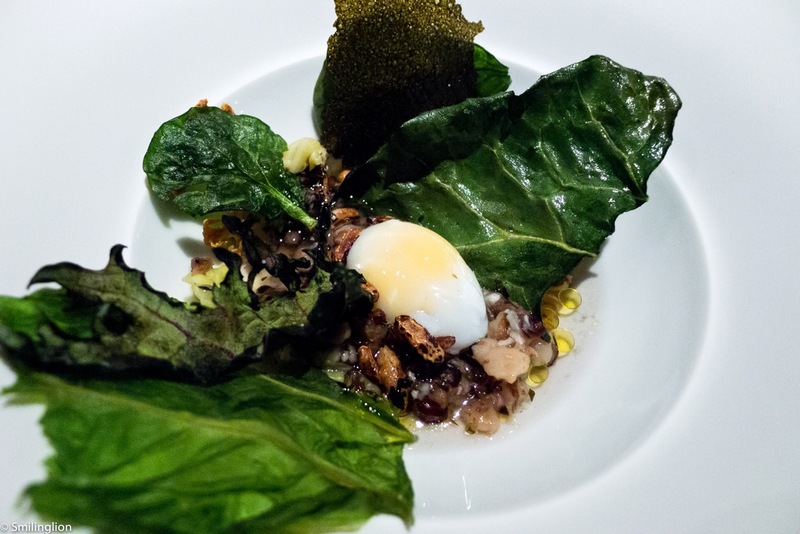 As the meal progressed and each dish was more 'cooked' than the previous, the next was the poached quail egg wrapped in dried brassicas and accompanied by a seaweed bouillabaisse on a bed of barley. 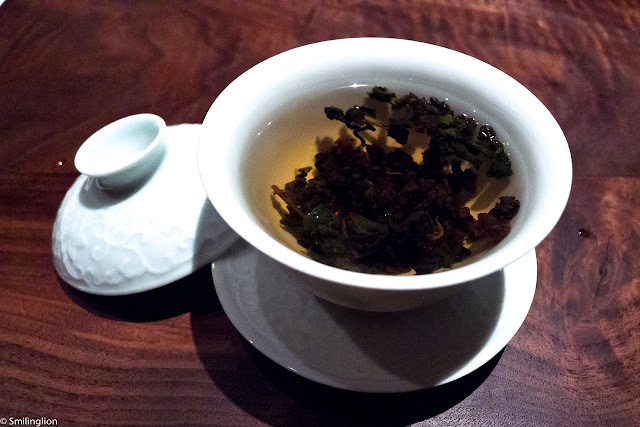 It was another unique blend of flavours which worked very well in this case. The small but immaculately cooked sea bream with thai curry powder was probably one of our favourite dishes. 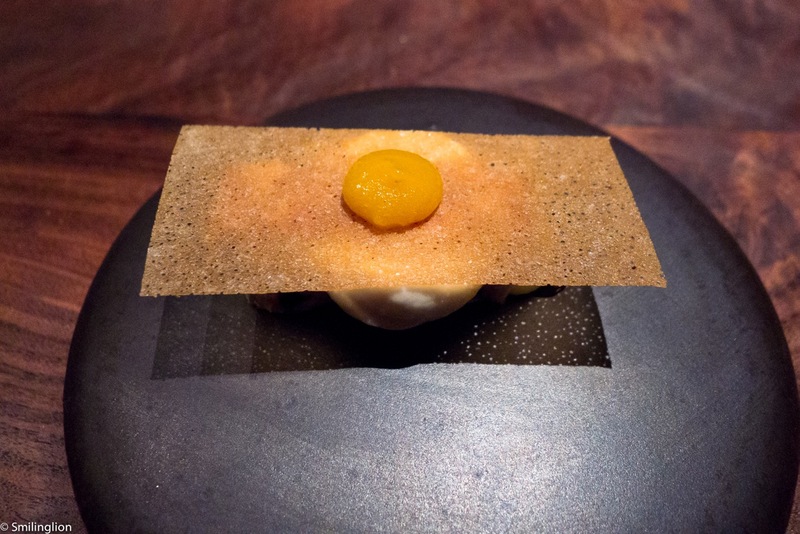 To cleanse our palate as we moved from the fish course to the meats, we had an intriguing chicken liver toffee with beer foam, white chocolate and bits of grapefruit pulp. The squab dish was quite spectacular. 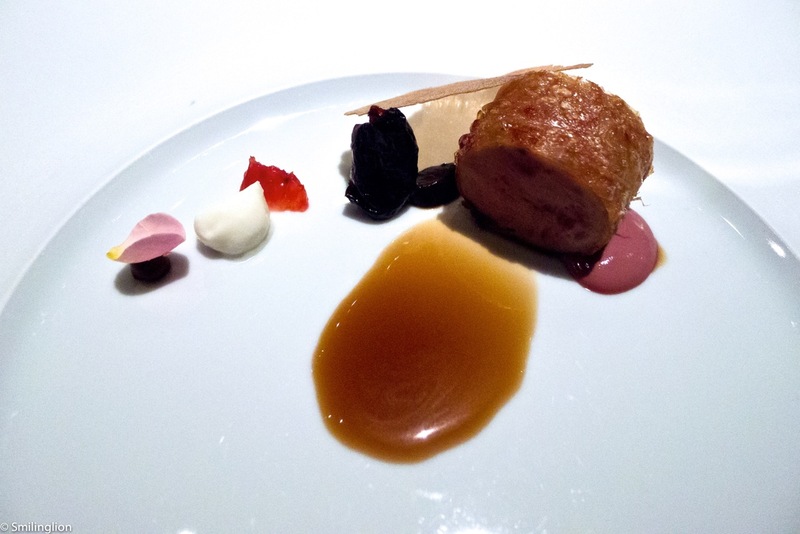 It was simplicity in itself: the meat, a sauce and a few drops of berry purees to balance out the flavours. 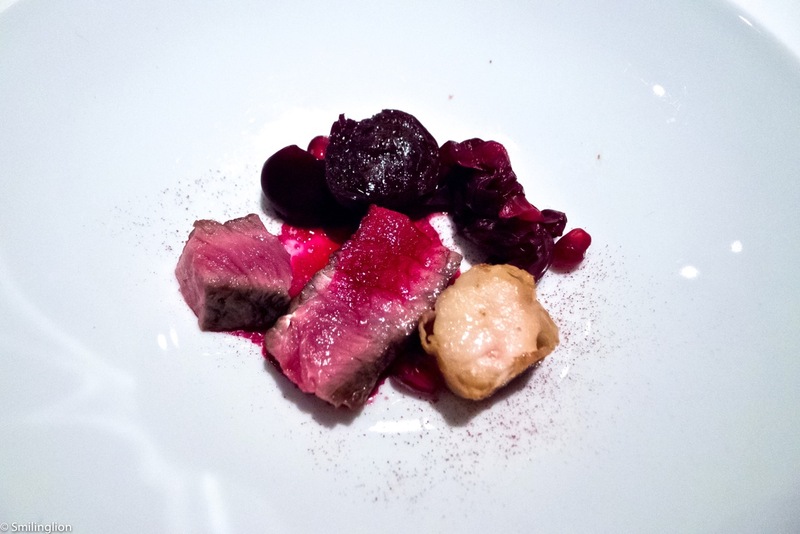 The 50 day aged Sylvia's beef was amazing; full of flavour which was bought out by the subtle sweetness of the accompanying beets. To go with the beef was the 2010 Saison Syrah from Napa Valley which was made by none other than Mark Bright himself, and it was very good. Cheese course was a puck of cheese with a sweetish cracker and a drop of jam on top, accompanied with a glass of 2009 Domaine D'Orfeuilles Vouvray from Loire. 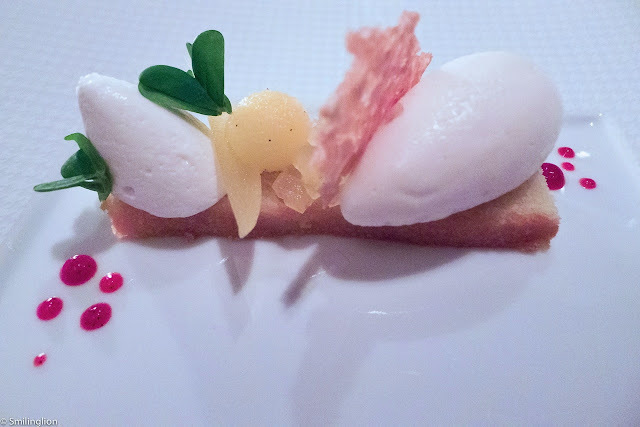 To further clean our palate before dessert, we had the sorbet (looking like it was squeezed out of a tube) and accompanied by slices of lemon meringue. It was very good. 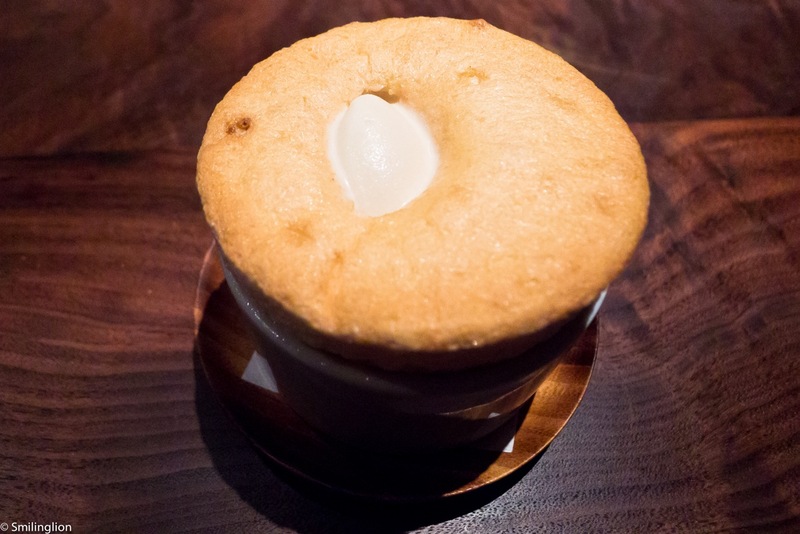 Finally, the pine nut soufflé which must rank as one of the best soufflés we have ever had. This was excellently paired with a sweet wine, the 2005 Chateau de Malle from Sauternes. 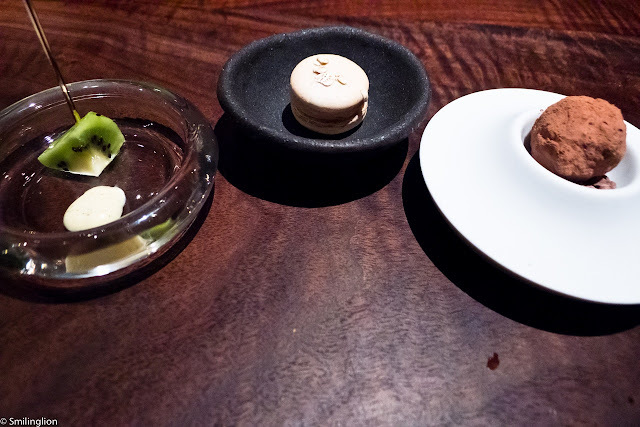 We had some Chinese black tea with our mignardises and canales, and were each given a piece of brioche to take home (for breakfast, which was very handy). 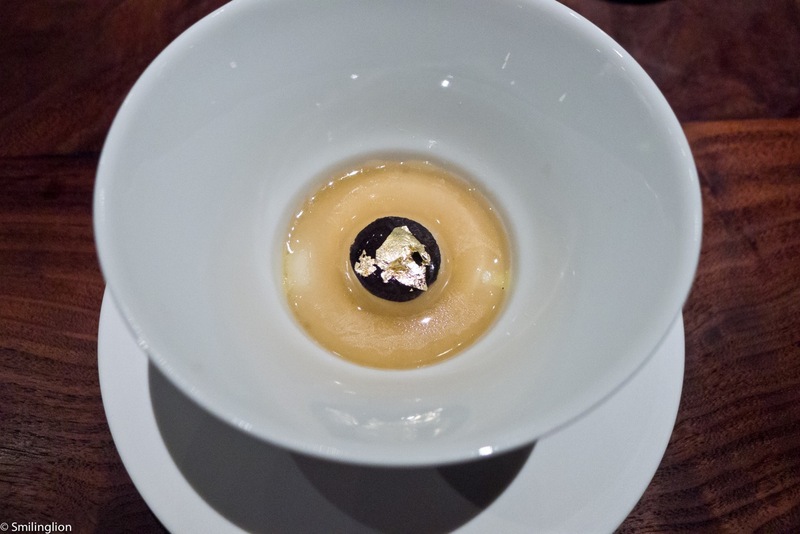 Impressions: If there was ever any instance which demonstrated the importance of the non-food aspects of the fine dining experience, this would be it. 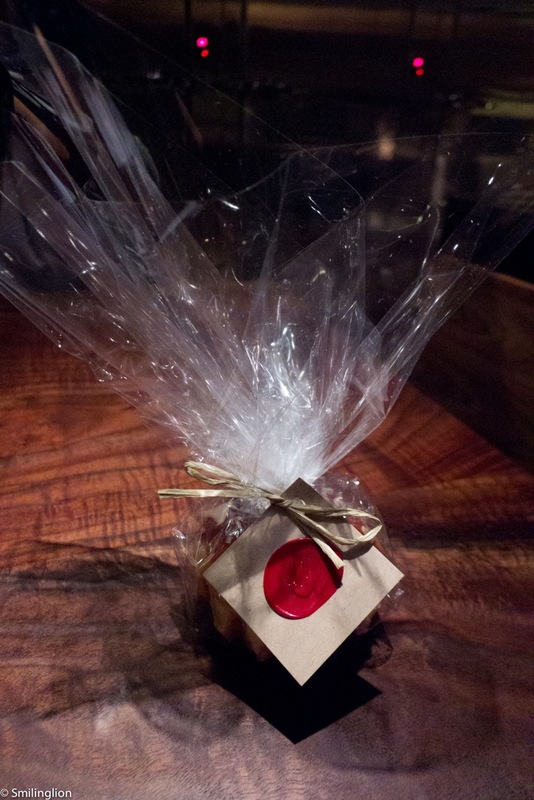 The concept of giving diners the personal attention of the chefs yet being seated away from the other guests was new to us and very successfully implemented in this case, and we cannot compliment enough the genuineness of the service that we had received that night. The food was excellent yet what we noticed was the clearly identifiable flow of the menu, from the raw to the cooked, from the seafood to vegetables to the meats and from the cold to the hot. In addition, each dish served was timed to perfection and we didn't feel that any dish came too soon or took too long. Maybe no one dish was the kind which would on its own bring us back here, but the seamless journey which Saison brought us through, in every aspect from the structure of the menu, the execution of the cuisine to the actual service of the food to our table, was in itself an object lesson of the art of fine dining. Daniel Patterson is a self-trained chef who, unlike most other big name chefs in highly feted restaurants, doesn't have in his CV stints in other famous dining establishments. 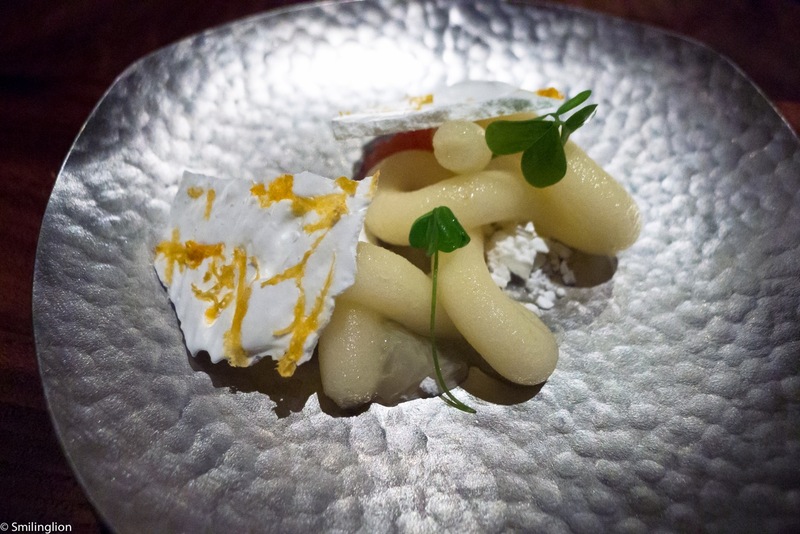 Despite his lack of culinary 'pedigree', his two Michelin starred restaurant in the San Francisco Financial District is well regarded for its modern and innovative Californian cuisine with an emphasis on regional produce. The restaurant has a rather small dining room which had tables reasonably well spaced yet retained its intimate feeling. There was only one menu for the evening, which was a 11 course tasting menu (there was no a la carte menu on offer). 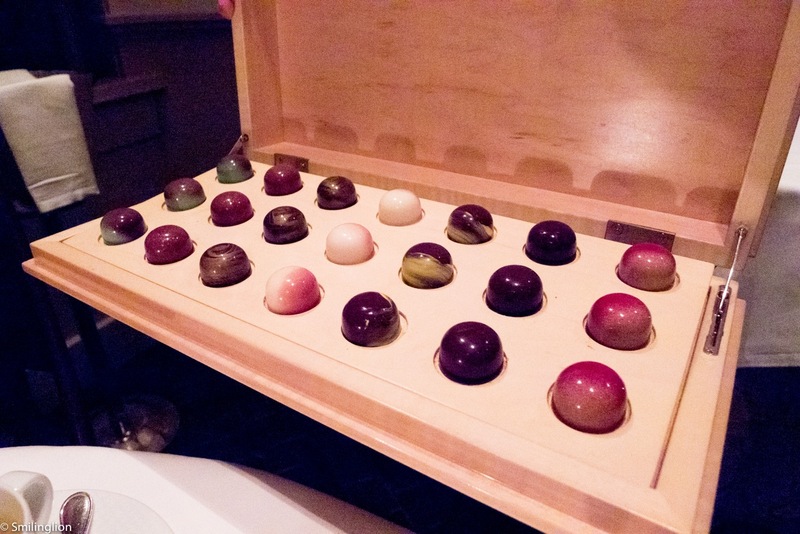 Curiously, it had quite a limited wine list and as a result, we opted for the wine pairing option. 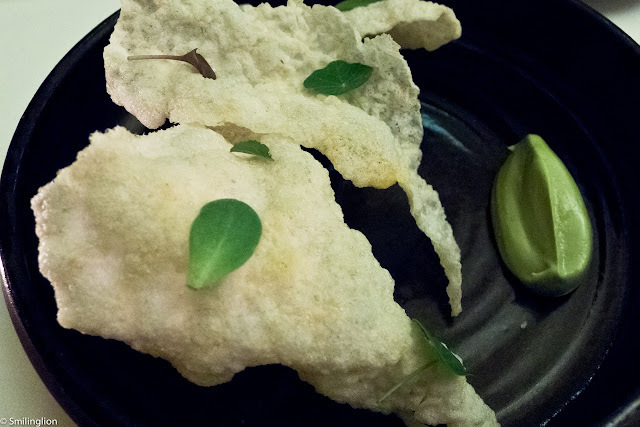 Amuse bouche was a very addictive plate of crackers with a flavourful avocado dip. 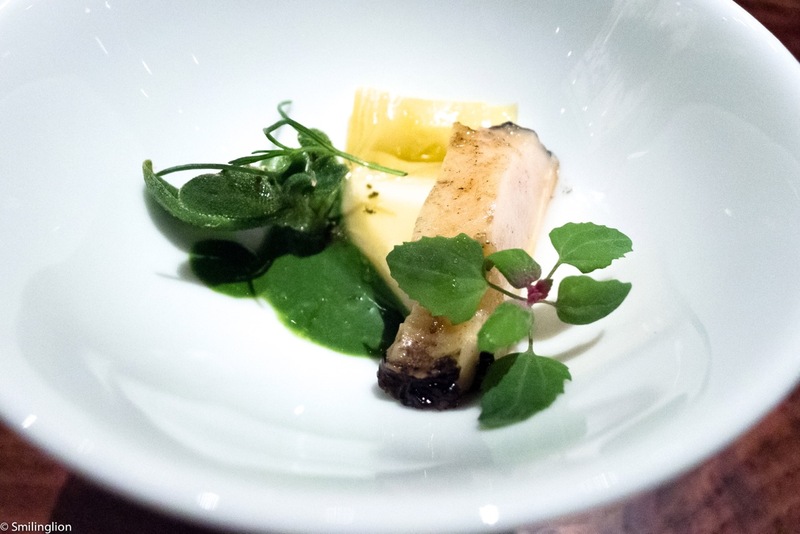 Earth and sea - geoduck, tofu coagulated in seawater, kale and oxalis: A subtly put together dish, with the taste of the briny clam barely noticeable, hence allowing the clean flavours of the tofu to come to the fore. Paired with 2001 Les Sablonnettes, 'Le Petit Blanc' Chenin Blanc, Loire, France. 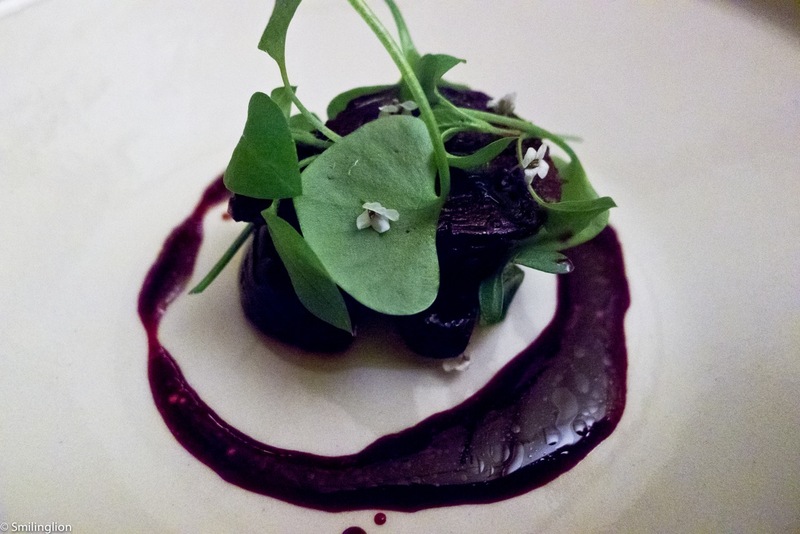 Beets marinated with native spices - wild herbs, meyer lemon: Another very interesting dish, with the very strong flavours of the beet perfectly matched with the accompanying glass of cider. Paired with Eric Bordelet, 'Tendre' Sidre Doux, Normandy, France. 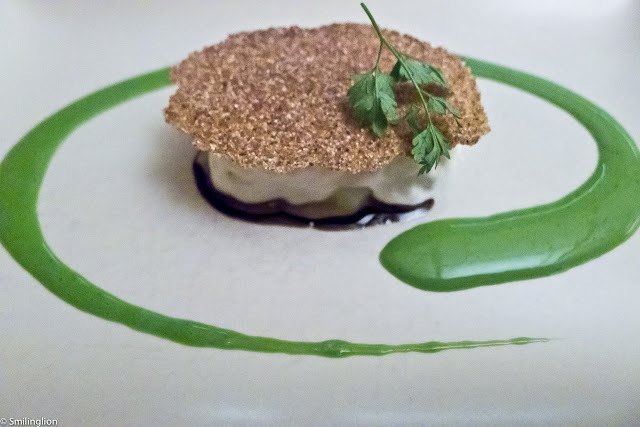 Inverted fromage blanc tart - fennel, wheatgrass: One of our favourite dishes of the night. The bitter taste of the wheatgrass was well balanced by the milkiness and slight curdish flavour of the cheese and the sweetness of the wholewheat biscuit. 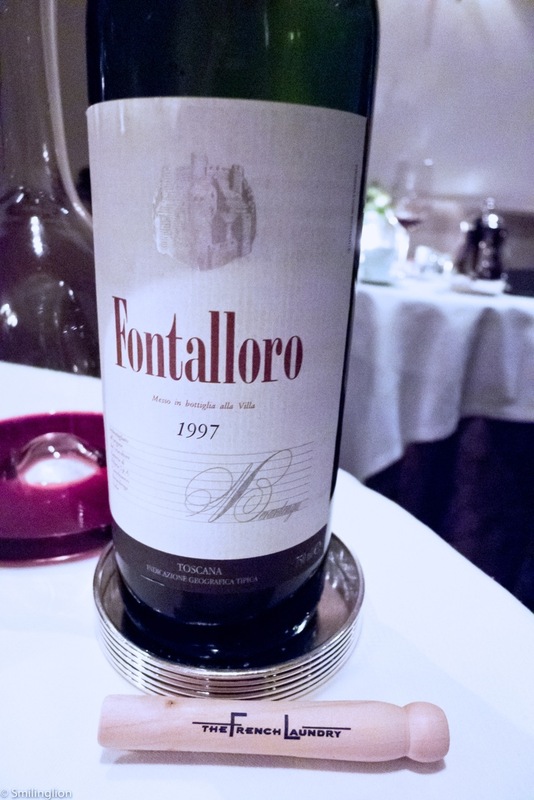 Paired with 2001 Scribe, 'Ode to Emil No. 11', Sonoma, California, USA. 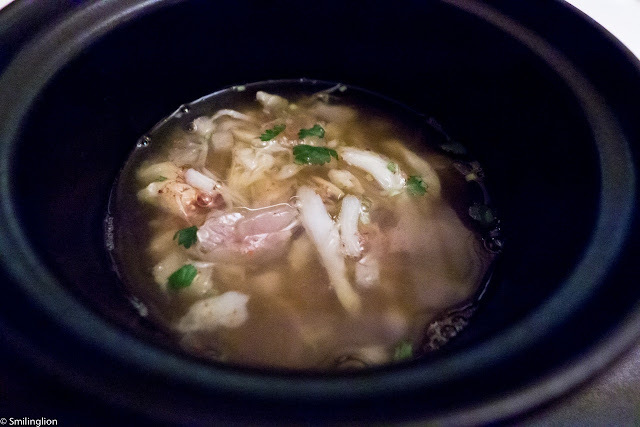 Dungeness crab / beef tendon soup: Another very sophisticated dish, the soup, filled with generous chunks of sweet dungeness crab, was surprisingly delicate. It was very well paired with a glass of sweet Riesling. 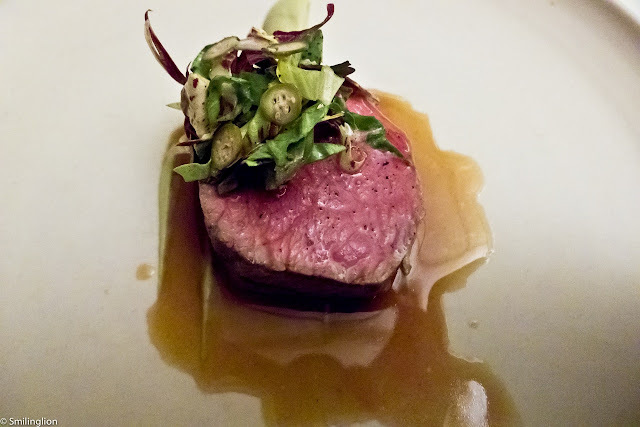 Paired with 2011 Brooks, 'Sweet P' Riesling, Eola-Amity Hills, Oregon, USA. New olive oil - brassicas, charred onion broth: Despite what it looked, this dish was all about the olive oil from McAvoy Ranch, which distinctive flavour cut through the savoury onion broth. The vegetables were merely accompaniments in this wonderful course which tempted us to lick our plates clean. 2011 Domaine du Tariquet, Cotes de Gascogne, France. Young carrots roasted in hay - radish, pecorino: The least impressive dish of the night, this was a showcase of fresh root vegetables common in the region in the winter. 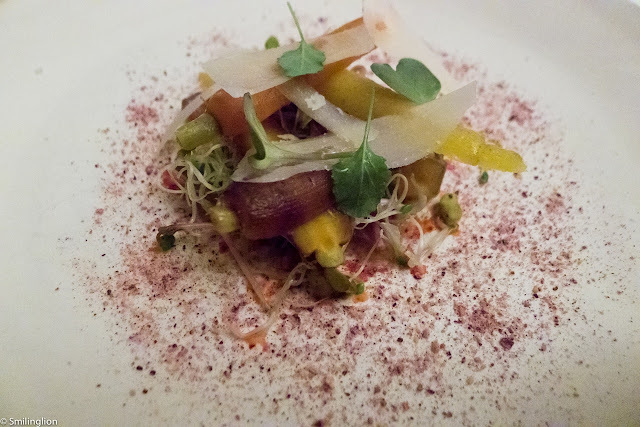 We thought a similar carrot dish at SPQR a few days before was much better. 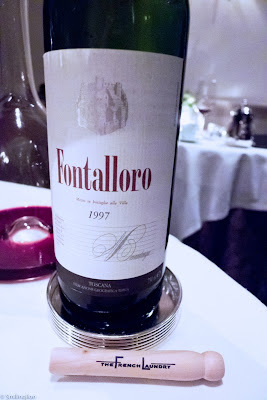 Paired with 1996 Lopez de Heredia, 'Vina Tondonia' Reserva, Rioja, Spain. 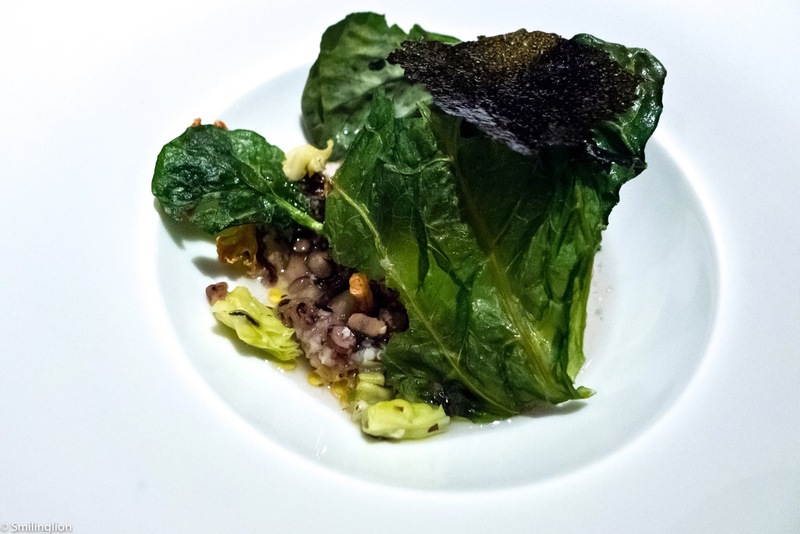 Monterey Bay abalone - grains, fresh seaweeds, turnip: The large chunks of abalone were quite deliciously matched with the squid ink and grains. 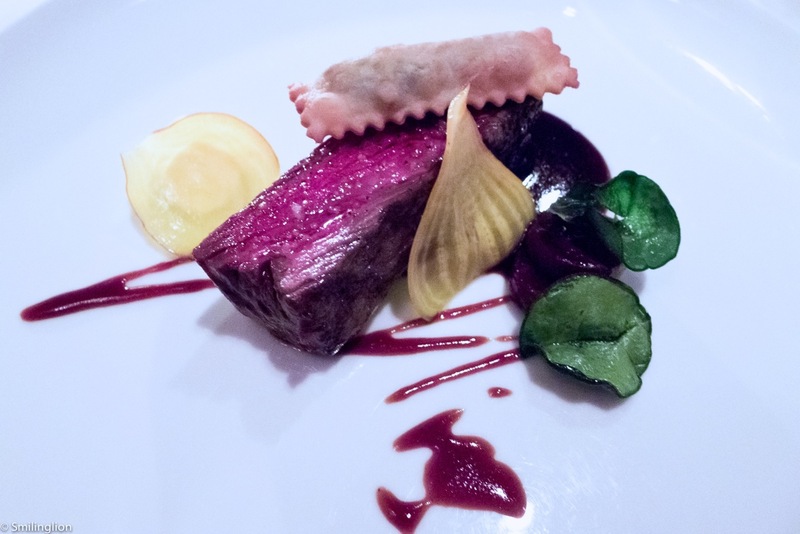 Paired with 2010 Rosesse, Feipu Dei Massaretti, Ligurie di Ponente (Riviera), Italy. Grass-fed veal - chicories, caper berry, seville orange: The veal was perfectly poached in olive oil then grilled, giving it a smoky flavour yet retaining its melt-in-your-mouth tenderness. We thought the seville orange made the sauce a bit too tart though. Paired with 2009 Mas Doix 'Salanques', Priorat, Spain. 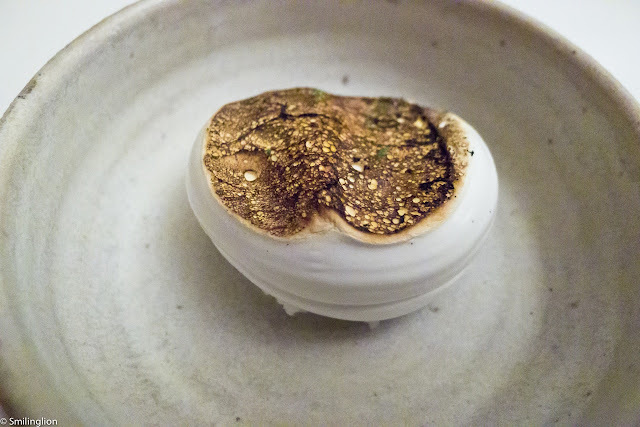 Frozen lime marshmallow - coal toasted meringue: This was a very interesting and fantastic dessert. The burnt marshmallow sat on a base of lime sorbet which combined both sweetness and tartness very well. This was accompanied by a sparkling moscato from one of our favourite Italian winemakers, La Spinetta. 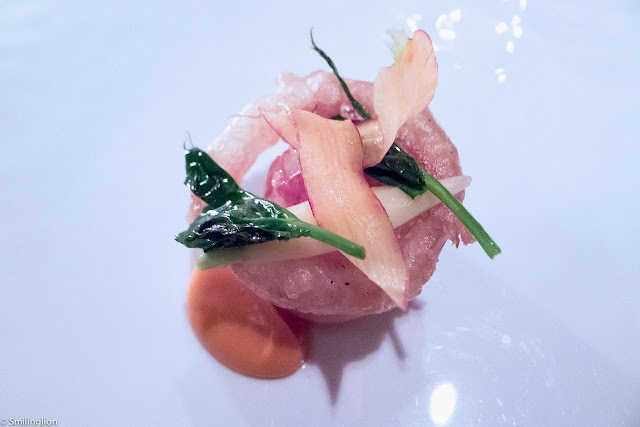 Paired with 2011 La Spinetta, 'Bricco Quaglia' Moscato d'Asti, Italy. 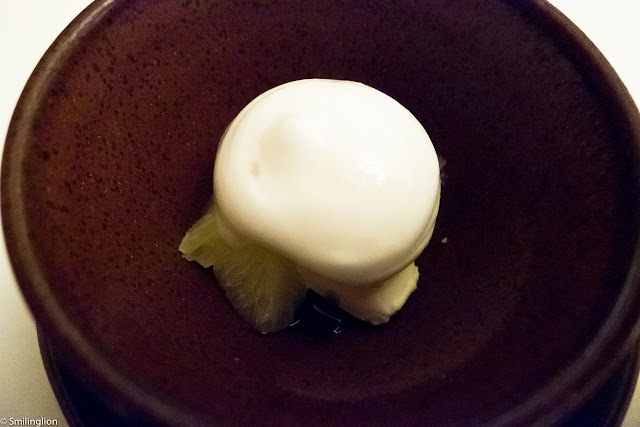 Oro Blanco - buttermilk-ginger sorbet, epazote: The local grapefruit was topped with a milky sorbet with a strong ginger and herb taste. Very unique and refreshing dessert. 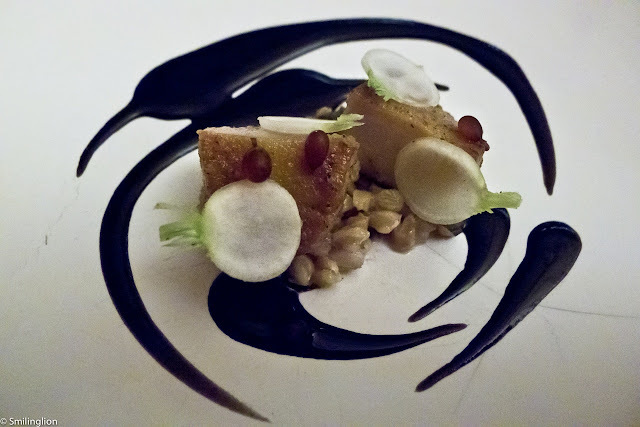 Paired with 2007 Eugen Muller, 'Forster Meriengarten' Riesling, Kabinett, Pfalz, Germany. 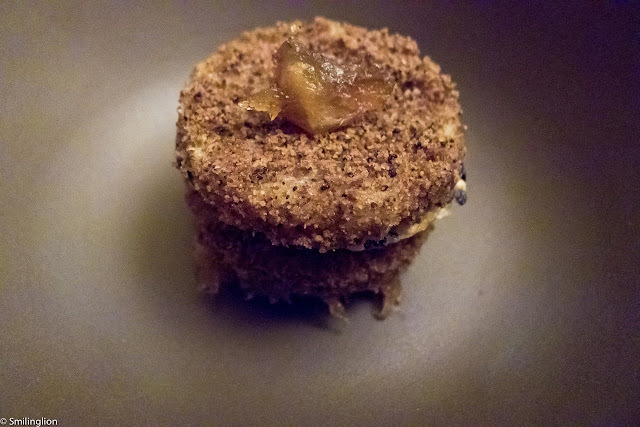 Spice cake - dates, sesame: Our favourite dessert for the night, this was quite extraordinary. The cake was made with 40 different spices and was soft and spongy yet full of flavours. Paired with Baladin, 'Nora' Spiced Ale, Piedmont, Italy. 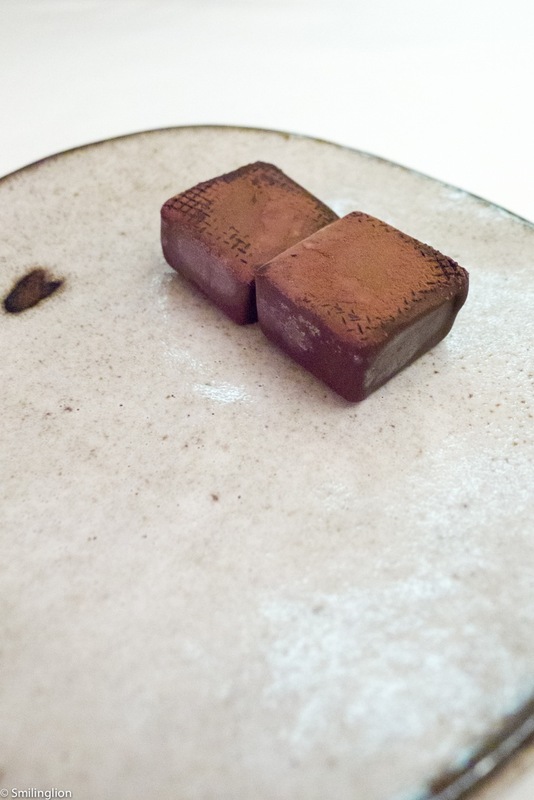 Petit four was a very simple yet elegant chocolate filled with cold syrup. Impressions: The food at Coi that night was quite extraordinary. 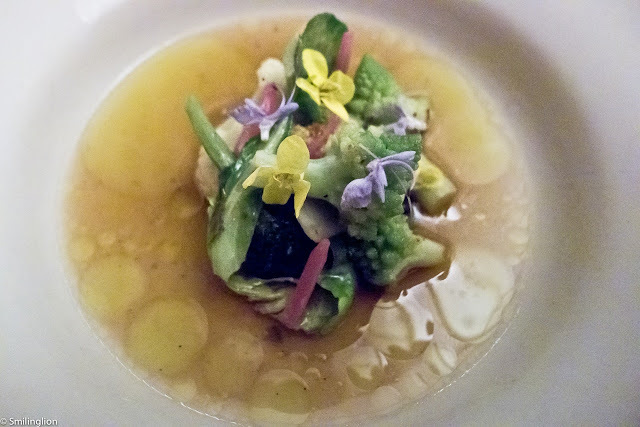 Chef Daniel Patterson is a master of subtlety and his pairing of different flavours (mostly herb or vegetable based) was pulled off expertly. However, we felt that aside from the food, the restaurant itself came across as quite cold. When we entered the restaurant, there wasn't anyone there to greet us and we had to wait a while to get someone's attention. The service, though professional and warmed up over the evening, was quite impersonal and we didn't get the friendly and sincere attention which had seemed to us to be a trademark characteristic of San Francisco dining. 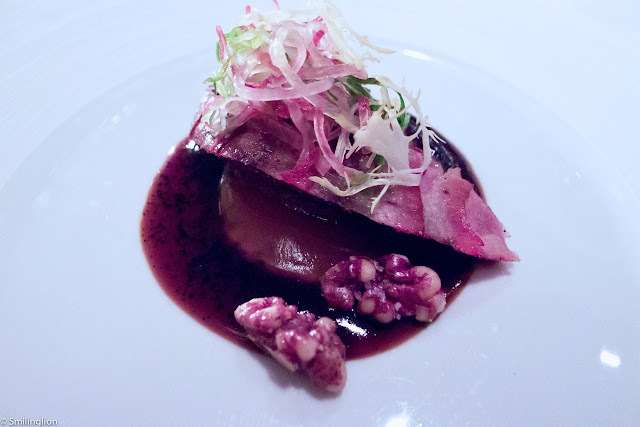 But overall, the quality of the cuisine won us over.